D-Jaxx is Not The Same in 2011.. The Philadelphia Eagles 2011 season has not gone according to plan in any capacity. Coming off a one-and-done last year in the NFC Wild Card round, Philadelphia re-tooled and re-energized their team by landing the biggest name free agents available in an attempt to get to the Super Bowl. Philadelphia was a Super Bowl favorite, and a big part of that was due to the Eagles’ deadly fast-attack offense led by Michael Vick. But Philly has flopped and disappointed their way to a (3-5) record with little to no consistency in their play. In a team full of underachievers, no one has disappointed in Philadelphia more than Pro-Bowl wide receiver DeSean Jackson. The electric and deadly fast wide receiver was thought to be Philadelphia’s best offensive weapon and to be a player that could be relied on week in and week out. Yet this season, Jackson only has 29 receptions for 503 yards, and a weak two touchdowns. For a wide receiver who is looking for a new contract, and one with big money involved, he certainly is not playing like he deserves it. Jackson and Vick had excellent chemistry last season and they were arguably the best wide receiver/quarterback combo in the NFL. But this season, Vick and Jackson seem to never be on the same page and have trouble connecting even on short passes. Vick has shifted his primary target from Jackson to Jeremy Maclin, and thus far this season, Jackson has been totally non-existent in a complete non-help to the team. There have been thoughts that the main issue in Philly is not with Jackson, but with the offensive play calling. I would buy this if the play calling has changed at all, but the simple fact of the matter is that it hasn’t and Andy Reid has kept the same base style of offense. The blunt truth is that Jackson is not making the plays he needs to, and that is hurting the Eagles win games. Whenever a complete drop in production has happened like it has with Jackson it means that there is a lapse in team chemistry. I am not sure what happened during this off-season, but Vick and Jackson are not on the same wave length to any extent. Given that Jackson is looking for a long-term deal with a chunk of change guaranteed, the Eagles need to think twice about extending him an offer. Jackson had two-straight 1,000 yard seasons before this year, and he was arguably the best deep threat wide receiver in the game. He could stretch the defense with his top-line speed and force double coverage, leaving another Eagle receiver open somewhere on the field. Jackson’s unique speed and playmaking ability allowed Vick to have several reads down field, and have plenty of options when scrambling out of the pocket. However, those times seem to have past. I would blame it on age, but Jackson is still only 24, and he should be in the prime of his career. The fact that his numbers have totally spiraled out of control and the Eagles offense continues to flounder, I don’t see any logic in re-signing Jackson. His value to the offense at this point is not worth the kind of money Philadelphia would have to give up, and there reamins the option of drafting an alternative. This class of wide receivers is incredibly deep with names like Justin Blackmon and Ryan Broyles as probable first round selections, and with the way the Eagles season is going, it is likely they will have a good pick. Even if Reid does his typical draft strategy, he could take a guy that could be considered a sleeper with a receiver like AJ Perkins from Illinois. The fact is that Jackson’s value to the Eagles is not what it used to be, and there should be questions regarding any type of contract that he could be offered. Also don’t forget that Jackson held out at the beginning of this season in an attempt to get a new contract early on, but the Eagles held strong and Jackson collapsed and came back to the team. 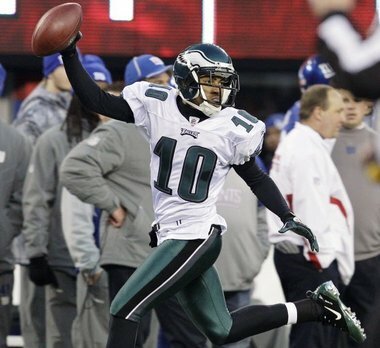 Given Philadelphia’s base offensive talent, the emergence of Maclin as a true number one receiver, and the depth of the 2012 draft, it should have Jackson walking right out of Philadelphia. I don’t want to undersell Jackson’s contribution to Philadelphia, and we was great to watch and an excellent threat on the field, but it seems that it may be time for the Eagles to part ways with him. Thanks for the help, Action Jackson, but we’ll pass on offering you the extension.